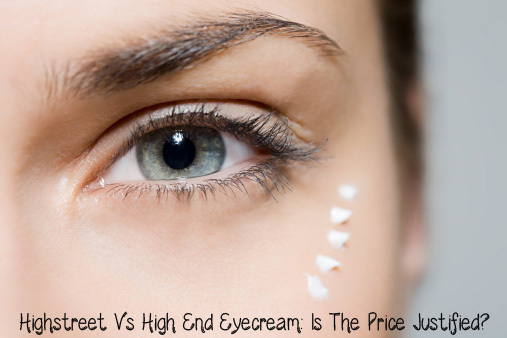 Highstreet Vs High End Eye Cream: Is The Price Really Justified? I reached the ripe old age of twenty five a few weeks back now, and it made me wonder if I needed to step it up a level with my skincare routine. After many scrutinising looks in the mirror and taking HD pictures of my eyes with my new camera, I've come to the conclusion that I don't have any signs of aging yet- although I'm beginning to accept the inevitable and realise that it will happen eventually. I don't want to look back in five or ten years time and wish I'd have done things differently, and if I turn out to be a wrinkled up old prune regret not investing in some better products. I'm quite happy to squander my money away on makeup because I can put it on my face and it will look pretty today, but often resent spending a fortune on products like eye cream. You can clearly feel the difference in your skin after using a good high end moisturiser, but I've tried both cheap and expensive eye cream and the two pretty much feel the same to me. Spending in excess of £60 (and a lot of brands go way, way above that) is enough to give me wrinkles just at the thought. So in our teens and twenties should we be splashing the cash on an expensive eye cream before the signs of aging have even kicked in? Or are our old faithful products from the highstreet: Olay, Garnier, Loreal etc enough to keep the wrinkles at bay? I've delved into the wonderous World Wide Web and found some information to help decide whether it's worth forking out a small fortune, or if products at less than a third of the price are just as good. The first question is do we even need a separate eye cream at all? Won't our facial moisturiser essentially do the same thing? According to one skin expert using any moisturizer for a period of time, even if it is not an eye cream, will significantly improve the appearance of fine lines for most people. However because the skin around our eyes is different to elsewhere on the face, a product designed for the eyes is recommended. I suppose in the same way you wouldn't put a body moisturiser on your face, you wouldn't put a face cream on your eyes; the skin is different and so has different needs. A properly formulated eye cream will be free of fragrances, mild on the eyes and easily absorbed so not to burn or sting the delicate skin. Using a product that's too heavy can cause puffiness and 'milial cysts,' which are like tiny whiteheads around the eyes (eeek). One of the reasons for the huge differences between high end and highstreet beauty products is the ingredients that are used. In the case of skincare and eye cream, it's active ingredients like Retinol, neuropeptides, hylauronic acid and ceramides that encourage collagen, elastin and new cell growth and help the skin to retain moisture. However, for anyone sensitive to these ingredients this might not necessarily be a good thing. Often cheaper brands will contain these ingredients but at lower levels, which might actually be better for younger or sensitive skin. The best way to find out whether more expensive eye creams work better, is to look at studies using blind trials. These are done by removing the packaging and label from a selection of products ranging in price, and asking participants to rate how they found them. This way any biases like brand or price expectation are eliminated. Product reviews are great, but these types of biases can skew opinions- for example if a person knows they're using a high end product they might be more inclined to think that it's working. Or on the other hand, be less impressed with the results knowing how much a product costs and the fact that they didn't see drastic and immediate results. Almost every study I could find that involved blind trials of eye cream found the same thing- that the less expensive brands performed the same (or sometimes even better) than products costing up to ten times more. Some of the studies I found were here, here, here and here. My verdict is that I definitely think it's worth investing in an eye cream, but that high-end isn't always better especially when you're a bit younger. A lot of the ingredients in high end products are designed to help smooth fine lines, and so I think to prevent the signs of aging using a brand from the highstreet to hydrate and protect the skin is easily enough. I suppose it's like anything you buy, sometimes you really do get what you pay for and other times a high price is all about the brand rather than how good it is. And that there are likely to be some inexpensive products out there that work wonders. Personally I think it's much more about finding what works best for you, rather than assuming because you're spending a small fortune it's definitely going to work. There's no doubt that there are super high end products out there with ingredients that will work wonders at smoothing fine lines and preventing wrinkles, but there are also a lot of less expensive options that when applied consistently will protect and hydrate the skin. Whether you use an expensive or budget eye cream, there's a certain way it should be applied in order to get the best benefits. Firstly it should be applied before moisturiser; regular moisturisers create a barrier on the skin which prevent eye cream from properly absorbing- meaning you will completely lose the benefits of applying it in the first place. Second is amount; the size of a pea is enough to cover the lower lids without over-saturating. There's such thing as 'too much of a good thing', since the lower eyelid skin is thin it can easily become irritated if active ingredients are over applied. Don't pull or tug the eyes and gently rub or pat in product with your ring finger to avoid being overly rough on the delicate skin, which could also contribute to fine lines. What are your opinions on this? Do you think you get what you pay for with high end brands, or that there are great brands from the highstreet that can often do the same thing? A regular moisturizer won't creat a barrier on your skin unless it says so. Eye creams should always be aplied at the END. I mean ALWAYS! NEVER pat your eye cream, it will make your eyes like look puffy, specially if you do it at night. You should "rub" it very gently with you wedding ring finger (because is the one with less pressure) in a circular motion to do an eye linfatic drainage and remove all the fluids that make up puffy. Yes ladies the only reason you have puffy eyes is from all that pating with eye cream! You need to drain your eyes so the fluids don«t acumulate. Really interesting. I have really good skin and I just can't justify expensive creams!! I am a new fan from the friendly bunch blog hop. your blog is put together beautifully and I love your content. I'm definitely in need of a new routine and some new products. I will take your suggestions under consideration. thank you. fyi... I tried to put your button on my blog as a blog I love and it tells me your content is protected and won't let me copy the code at all. Glad to see you found your way to our weekly Friendly Bunch Blog Hop! I really hope you find some really cool new reads to enjoy! I"m 31 and haven't started using an eye cream. I think I better start before it's too late. Great post! I'm a new follower from the Blog Hop! This is so informative! I am also looking for a great eye cream as I am in my late 20's. Im only 23 and I am OBSESSED with eyecreams! Have your tried Mario Badescu's gel eye cream? I'll be reviewing it soon. Its AMAZING! I'm a new follower from bloglovetherapy. It would mean alot if you follow and check out my blog. i've tried so many, many creams for my lines around my eyes (and against my dark circles), but regardless of high-end or high-street, they just don't seem to work for me. so i'm looking into getting this treatment done: http://www.londonpremierlaser.co.uk/sublative.php what do you think? do you think i should give that a go? it doesn't look as invasive as botox, so i thought it might be worth it?